Time-lapse photography is all the rage right now. This may be because video in general is becoming more and more popular with still photographers. Perhaps photographers are looking for new ways to take their work to the next level, and time-lapse is a way to do just that. Regardless of the reason, the number of time-lapse videos that are being shared seems to be on the rise. One thing is for sure: capturing images for time-lapse sequences is easier than ever. Most new camera models have a built-in intervalometer. Some even have in-camera time-lapse video processing features. Creating time-lapses is tons of fun, and maybe that's all the reason you really need to give it a try. It doesn't matter if you are using the latest and greatest camera and lenses or entry-level gear. It also doesn't matter if you are shooting for a very simple time-lapse video or something very complex. This baker's dozen of time-lapse photography tips will help you on the way to creating dramatic and dynamic imagery for your portfolio. As a quick disclaimer, this is not a how-to article on how to set up, shoot, and post-process a time-lapse video. Check out this article by Jim Harmer for a more complete guide or this article for post-processing in Photoshop. We've all been there. You get on location, get everything set up to shoot, then realize that you forgot to charge the camera battery. What's worse is that you also forgot to pack any extras. Most DSLR camera batteries will last a fairly long time on a full charge. Mirrorless cameras, not so much. Whichever camera you use, make sure the battery is fully charged in advance of going out to shoot. I always carry two extra batteries for my Canon 5D Mark III and 3-4 extras for my Fuji X-T1. Sure, they add a little bit of weight to the bag, but it is vital to have the necessary power to run the camera. This is also true for any external intervalometer, panning head, slider, or other device that requires batteries. Make sure everything is fully charged and carry extra batteries. A portable charger such as this one is handy to have along for devices that allow for USB charging. One question that often comes up pertaining to time-lapse photography is how long the interval should be between image captures. This can vary greatly, depending on the amount and speed of movement in the scene. For fast-moving objects, the intervals between shots should be short. For example, traffic or clouds that are moving fast should have an interval of around one to two seconds. If the interval is too long, then the final video will look choppy, as the objects are moving so far between shots. On the contrary, extremely slow moving scenes, such as a flower bloom opening or a construction site, intervals may be several minutes or even hours apart. Adding music to a time-lapse video can make a much more interesting and dramatic finished product. It is important, however, for the music to match the action. A fast and violent thunderstorm video would benefit from an up-tempo, dramatic musical selection. A quieter, more serene song would be more suitable for slower-moving action. When planning a time-lapse sequence, try making the music selection first, which could help you determine what to shoot. Improve Photography highly recommends StoryBlocks for songs for your videos. They are pretty inexpensive and have EXCELLENT licensing terms that allow you to use it in commercial projects, on videos with millions of views, etc. Many stock audio places have restrictive terms, and StoryBlocks is the best I've found. I realize that not everyone has two camera bodies. However, for those who have upgraded and held on to your old camera as a backup, use the old camera to shoot time-lapses. First of all, the old camera will likely work out just fine for shooting a time-lapse. One exception could be if you are shooting at night at high ISOs and the old camera doesn't perform well in that situation. If your backup is a film camera, you are probably not going to want to use that. Another advantage to using the backup is that you will conserve the shutter on your primary camera body. Shooting time-lapses racks up the shutter count in a hurry. Flicker is the bane of time-lapse photography. 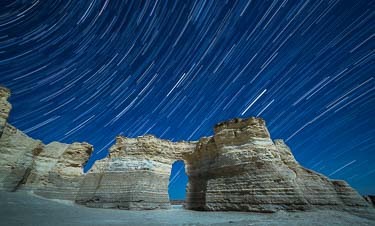 Even small changes in the exposure from frame to frame can cause it, and it can ruin an otherwise great time-lapse video. One way to minimize it from happening is to keep the exposure consistent by shooting in manual mode. This means that the shutter speed, aperture, and ISO will remain the same throughout the sequence. This works great as long as there are no significant changes in the ambient lighting conditions. You can shoot during the day or at night without much of an issue. Going from day to night or vice-versa is an entirely different story. This is known as the “holy grail” time-lapse technique, and requires the exposure to be adjusted throughout the shoot as the light changes. Exposure adjustments can be made manually or by using a device that makes the changes for you. This is an advanced technique that I won't cover in this article. Just as you do not want exposure to change, you also don't want the focus to change throughout the shooting sequence. First, focus where you want in the scene using either manual focus or auto-focus. Then, switch the camera and/or lens to manual focus. As an extra precaution, use a piece of gaffer's tape to hold the focus ring on the lens and prevent it from getting bumped. Finding focus at night presents some challenges. Check out this article for some tips on how to get sharp images, even when it is dark outside. Because time-lapses require tons of images, you will be tempted to shoot JPEGs to save space on the memory card and hard drive. This may be fine for some situations, but for the most part, just don't do it. Shooting in JPEG format means that you are allowing the camera to process the images how it wants and throwing out a lot of the image data. Shooting RAW is much more preferable in most cases. It will afford you much more latitude for post-processing the images how you want them. Hard drive space is relatively inexpensive, so don't worry so much about that. Besides, after processing the final time-lapse video, you may decide to delete the images anyway. This may sound strange since the whole point of shooting time-lapses is to show motion. However, the camera remains stationary for a typical time-lapse. In order to really level up your time-lapse creations, try moving the camera while shooting the image sequence. This is accomplished by mounting the camera to a motorized pan/tilt head and/or a slider. As the camera is firing away, it is also moving very slowly. There are a number of products on the market that can be used, greatly ranging in price. Jim Harmer has been raving about the Rhino Slider recently, which appears to be a very good system. Also, check out my review of the Syrp Genie Mini panning head. As you probably already know, shooting time-lapses is a big time commitment. Depending on the location and weather conditions, you may be able to set up the camera to shoot and then just leave and come back to it later. However, many times you will want to at least be close by to keep watch on your gear to make sure everything continues to work as expected, batteries get swapped out as necessary, or just to make sure it doesn't walk away. Waiting for the camera to capture hundreds, if not thousands, of images takes time. Make sure you are prepared for the wait. Dressing appropriately for the weather conditions is a huge part of this. If it's cold, make sure to wear layers, and especially pay close attention to hands and feet. You can always remove layers if it warms up later. If the conditions are hot, wear lightweight, breathable clothing that wicks perspiration and keeps the skin dry. Make sure you are protected from the sun by finding some shade or bringing your own. If the weather forecast shows a possibility for rain, make sure you and your gear will be protected. Also, bring along water, snacks, and a small stool or chair to relax. The more comfortable you are, the better the shoot will be. So here is the scenario: you arrive on location, get everything set up, begin shooting the time-lapse, and get comfortable right next to your tripod. About 30 minutes into the shoot, you decide to get up a take a little walk. As you do so, you inadvertently bump and move the tripod. In all likelihood, the shot is ruined and you will need to start all over again. Thirty minutes isn't a huge deal, but what if it were 2 hours? Lesson learned. Getting comfortable is important (see Tip #9), but keep a safe distance from the tripod, if at all possible. The last thing you want to do is bump the tripod while shifting in your seat or getting up and down. If you are set up on relatively soft ground, and if your tripod is compatible, consider switching out the regular tripod feet for spikes. Using spikes will plant your tripod's legs in the soft ground and help prevent it from moving. I've been using the these spikes made by Desmond for a while with great success. The weather doesn't always cooperate to make for ideal photography conditions. There have been plenty of times that I've went out thinking that it was going to be clear for astrophotography or that light cloud cover would blow up into some beautiful sunset color, only to be disappointed by what really happens. That's part of photography, and sometimes you just have to work with what you get. If the white puffy clouds you thought were going to make a great time-lapse dissipate and you are left with clear skies, find something else interesting to show. If the sky is not interesting, minimize it in the images or cut it out altogether. One thing that could work is to show the advancement of shadows through a scene. The possibilities are endless, so put on your creativity thinking cap and get busy! NOAA Hi-Def Radar – for iOS and Android users; cost is $2.99; most anything weather-related you would need to know about. Golden Hour One – for iOS users only; cost is $3.99; find out weather information, as well as the best time for the best light and sun position for your location. Storm – for iOS and Android users; shows storm tracks and other weather information; and it's free. MyRadar – for iOS only; it's free and is an essential tool for storm chasers. Dark Sky Finder – for iOS only; cost is $2.99; used to find darkest skies possible for astrophotography shoots. Really Good Photo Spots (rGPS) – iOS version only; massive database of photo locations for scouting; free and paid versions. Get it on the iPhone app store. Photo Pills – for iOS and Android users; tons of useful information for landscape and astrophotographers; cost is $9.99! Google Earth – iOS and Android compatible; great for virtually scouting of potential shooting locations; and it's free! The Photographer's Ephemeris – iOS and Android compatible; works well for lining up shots; similar to Photo Pills, but costs $8.99. PlanIt! for Photographers – iOS and Android compatible; similar features and functionality as Photo Pills; cost is $5.99. Time-lapse videos are typically played back at 24 or 30 frames per second (fps). That means you will need between 240 and 300 images for just 10 seconds of video. Before you begin shooting, calculate how many shots you will need based on the shooting interval and length of video clip desired. It may already seem like a lot of images, but shoot plenty of extras. It's better to have too many than not enough.